And now some hourly workers are fighting back against the inequality. CEO Howard Schultz speaks during the Starbucks annual meeting of shareholders on Wednesday. He’s stepping down this month as chief executive. Starbucks grabbed headlines and accolades earlier this year for giving its hourly workers parental leave, but few people paid attention to the inequality baked into the fine print: The coffee giant is providing vastly better benefits to its already well-paid, white-collar corporate employees. Under the new policy, which takes effect in October, Starbucks white-collar employees who give birth to a baby are eligible for up to 18 weeks paid time off. That’s three times as much as the six weeks a woman working in a Starbucks store would get if she has a baby. 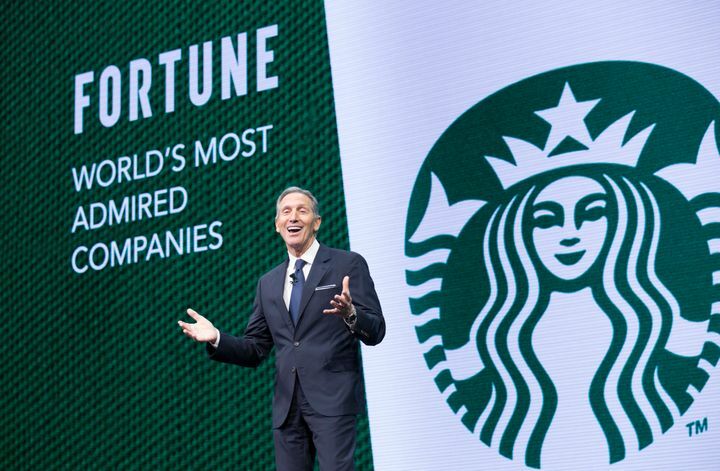 Known for giving generous benefits to the hourly workers that comprise the vast majority of its 180,000 employees in the U.S., Starbucks called this new policy “exceptional” in a press release in January. This week a few Starbucks employees traveled to the company’s annual shareholder meeting in Seattle to deliver three petitions, with more than 80,000 signatures from employees and others, demanding equal parental leave benefits. Since then, her partner’s picked up double-shifts for his job as a server in a restaurant. She went back to work last month ― sooner than she would’ve liked. “We’re stressed out,” the 22-year-old new mom says of her current situation, laughing when this reporter asked about their savings. If she worked in corporate, she’d still be home with her son, she said. And that would be better for everyone. Few would argue that big companies like Starbucks should practice equality when it comes to pay. Employees get paid different salaries and that’s how it works. A cashier probably shouldn’t make the same salary as the CEO. But parental leave is a different ballgame. And, as Starbucks is finding out, it’s hard to justify why some types of workers “deserve” more time with their children than others. Netflix ran into a similar issue a few years ago, after the Huffington Post reported that its hourly workers weren’t eligible for the same amount of parental leave benefits as its salaried workers. When asked to explain the discrepancy, a Starbucks spokesperson reiterated phrasing from its January press release, saying the expanded benefits for corporate employees were intended to “seek and retain non-store talent.” In other words, the company is competing more fiercely for these workers and needs to do more to attract them. Johnson, who is slated to take the reins as CEO in April, said the parental leave policy was what they were able to offer at this time. The more generous non-store worker policy actually applies to very few Starbucks employees. Of its 170,000 U.S. workers, all but 8,000 work in its stores, according to company data. And that handful of workers makes lots more money. While store workers at the company make around $10 or so an hour; pay at corporate headquarters ― for roles like systems analyst, human resource manager or IT manager ― can run into the six-figures, according to data on Glassdoor. Starbucks is hardly the only retailer to give better benefits to its white-collar workers. Walmart gives women in its corporate office 12 weeks of paid maternity leave and its hourly workers get none, according to data compiled by Paid Leave U.S., a nonprofit advocacy group. Yum Brands only gives paid leave to corporate full-timers; not to workers in its fast-food restaurants, according to PLUS’s data. The group is planning on releasing its analysis later this year. A handful of big companies have decided to buck the trend and offer all of its workers ― hourly or salaried ― equal benefits, including Ikea, Nordstrom and Levi’s. But they’re unusual. Paid leave inequality is something that labor groups are starting to pay more attention to, said Brianna Cayo Cotter, chief of staff at Paid Leave U.S.
“The people that most need paid leave benefits are the ones being left out of these policies,” said Cotter. Her nonprofit is working alongside Working Washington, a local labor group, to push Starbucks to further improve its policy. The rub is that a typical low-wage worker is in far greater need of paid time off than her higher-paid counterpart. Nearly half of low-income workers who take unpaid or partially paid leave turn to government benefits to get by, according to a Pew study released Thursday afternoon. An even larger percentage take on debt. One in four women are back to work less than two weeks after they give birth, that’s not enough time to even physically recover from labor. The United States is one of only a handful of countries that doesn’t offer new mothers paid maternity leave. It’s the only advanced economy with no mandated sick time. That means that it’s left to the private sector to dole out what is essentially a public benefit. And of course that leads to inequality. The most competitive, highest paying jobs are the ones that offer paid leave. And Americans apparently want to leave this policy in the private sector’s hands, the Pew study found. 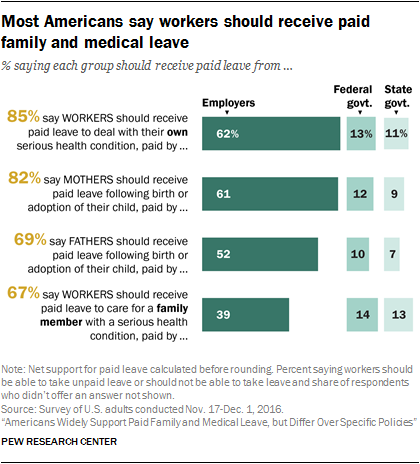 While the majority of survey respondents said they support paid parental leave, respondents also said that companies should be the ones to offer it. Americans were split on whether the government should require employers to offer the benefit. Most Democrats said yes; while Republican respondents disagreed. Jess Svabinek is a 37-year-old barista at a Starbucks about 40 miles outside of Seattle. She makes $11 an hour and is expecting baby this summer ― her fourth. She’ll have her baby before the benefits go into effect and she’s not sure if she is up to 20 hours a week, so she’s been tucking away her tips to save up for diapers. Her husband earns $21.50 an hour at Trader Joe’s. “We’re lucky,” Svabinek says, noting that last year they made slightly more than $50,000. He works days; she works nights; handing off the kids, an 11-year-old and six-year-old twins, in a tag team parenting style that carries a lot of hourly workers through their days. She was at the shareholder meeting Wednesday and had time to visit the Starbucks store at corporate headquarters. She said she watched the store workers smiling and serving their corporate employee counterparts coffees.